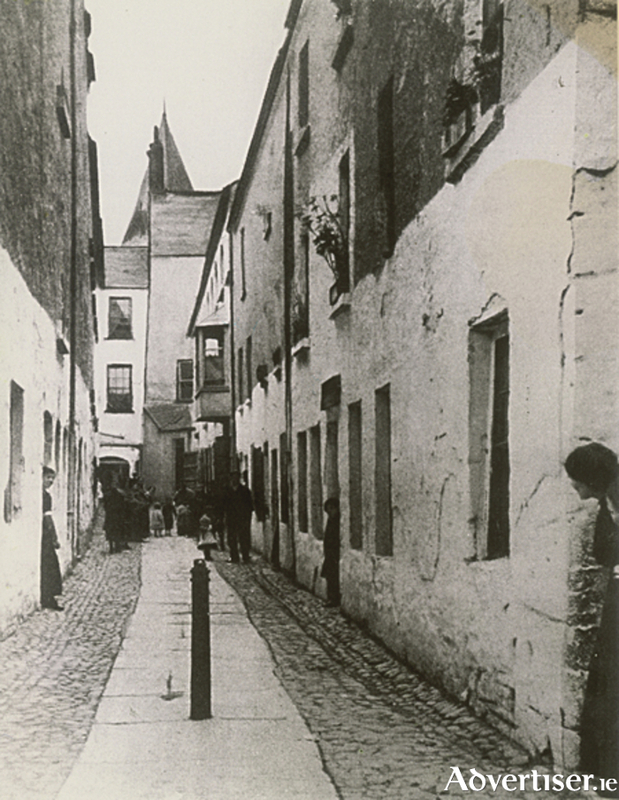 At the time this photograph was taken about 100 years ago, Buttermilk Lane was made up of tenement buildings, some of which housed multiple families. For example, three families lived in Number 2 in 1911; three in Number 4; five in Number 6. There were people with nine different surnames in Number 7, and eight different surnames in Number 8. Among those who lived on the right were Connollys who were shoemakers; Kennedys; McDonaghs; another Connolly who had a little grocery shop; and Haynes’. Tom Daly lived around the corner and the rooms over him were occupied by the Kelly family. Michael Hehir lived on the left hand side, as did Patrick Murphy; Mrs King and her son Tommy; Mrs Cox; Mr Burns, a tinsmith; Mr Barrett lived at the end; and Mrs Connolly at the top. The lane was very crowded and probably very unhealthy and it was a relief when the residents were moved out to the newly built housing estate that was Shantalla in the early 1940s. This move out to the ‘wild west’ was immortalized by Walter Macken in his play Mungo’s Mansion. A century before, Buttermilk Lane was a ‘posh’ address, a fashionable area frequented by judges and doctors, etc. Daniel O’Connell, “The Liberator”, stayed there when he came to Galway to address the monster meeting at Shantalla. Legend has it that he spoke to a large crowd from the Oriel window which you can see up near the top of the lane on the right. We presume that the lane got its name from groups of women trying to sell buttermilk there, just as there was an egg and butter market or a sock market in other parts of the city. This lane features on a map of Galway dated 1567 as Upper Shoemaker’s Lane, in 1712 it was called Broguemaker’s Lane, and on a 1721 map it became known as Buttermilk Lane, which translated in Irish to Bóthairín na Sudairí, or sometimes Bóthairín na Blátha. Buttermilk Walk features on the 1651 map as Shoemaker’s Lane Lower, it was known as Lynche’s Alley on an 1818 map, and St Augustine’s Lane on an 1881 map. In Irish it was Slí na Sudairí or Slí na Blátha. The lane began to change in the 1960s when GTM took over most of the right hand side. Today Anthony Ryan’s owns both sides of this quaint little street and its lines are still attractive to the eye for visual artists, in spite of the awful erection at the end. You will know a person is an ‘Old Galwegian’ if you see them blessing themselves as they walk on Shop Street past the top of the lane.